Navajo Blanket | Retired Ponies Figurines | One Price Low Flat Shipping! From the Trail of Painted Ponies Collection, Navajo Blanket. Designed by artist, Barbara Tomasko. Made of ceramic. Measures 6" tall. Manufactured by Westland Giftware 2003. This rare pony is from the very first release. 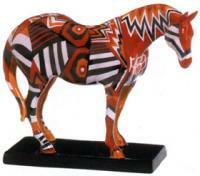 Navajo Blanket is a must-have for the elite Trail of Painted Ponies Collector. After receiving a degree from the Boston Museum School of Fine Art, New Englander Barbara Tomasko Quimby moved to Wagon Mound, New Mexico, where she fell in love with the native cultures and people of the West. Admiring the artistry displayed by Navajo women weaving fabulous blankets with thread on loom, she was moved to create this tribute, incorporating the color and design.